The United Kingdom Development Programme in Tanzania: statement by the United Kingdom High Commissioner in Tanzania. (1) Technical Cooperation is provided under a Technical Assistance Agreement signed in 1975. This envisaged an expenditure of £1 million a year but present expenditure is substantially in excess of this figure. At present we have about 25 Technical Co-operation Officers fully funded from UK and approximately 75 supplemented staff at the University and with ex-East African Community organisations such as the Harbours Corporation. It is expected that the TCO figure will double next year with the influx of experts for integrated regional development projects in Mtwara, Lindi and Tabora Regions. Training courses for Tanzanians 1n Britain are provided under an annual Training Grant. The Training Grant for 1977/78 has been estimated at £780,OOO, £521.000 of which will be for (about 200) new awards. – Grant (No.l) 1977 £3.5 million. – Farm Purchase. Approximately £1 million for purchase of a number of British-owned mixed farms in West Kilimanjaro for transfer to ownership of the National Agriculture and Food Corporation. Completed. – West Kilimanjaro Re-equipment Project. £1 million over a period of 6 years for new equipment for the above farms. Initial order now placed. – Dodoma Village Water Supply. £285,000 for providing clean water to 7 villages in the Dodoma region. Consultants now to be appointed to supervise implementation. (i) Roads Component. £2.47 million plus £364,000 Technical Assistance. Consultants have been appointed. (ii) Land Use Planning – Technical Assistance of £1,405,000. The first members of the team hope to arrive in January 1978. – TAFICO (Tanzanian Fisheries Corporation) – purchase of 3 fishing vessels. Original allocation of £110,000 increased to £160,000. Vessels have been ordered and should arrive early next year. – Training for Maji (Ministry of Water) – Original estimate for £92,OOO for buildings, equipment and tools increased to £120,000. An advance order of equipment has been placed and a TCO Training Officer is awaited. – Grain storage – Seasonal. £873,000 for construction of two go-downs at Songea and Makambako. Tender of construction firm recommended by the Consu1tants was above the cost budgeted for and London’s authority to increase the allocation is awaited. – Grain storage – Strategic. £4,863,000 for 30,000 tonnes of storage capacity at Dodoma and 10,000 tonnes of storage capacity at Shinyanga to be built by 1979. Subject to a review of requirements by both Governments a further 10,000 tonnes of storage capacity should be completed at Shinyanga by mid 1981. – Upgrading of Songea-Makambako Road. Pre1iminary consultancy under way and final decision on UL contribution to be made early 1970. Southern Regions Plan Support. It has been agreed that in future British development projects will be concentrated primarily in the southernmost regions of Lindi and Mtwara. A team of plan support officers will be recruited to reinforce existing regional planning capacity, and it is our intention that this team will at the same time help to identify a succession of capital projects for UK funding. Amazingly the price of the report is now nearly halved – a refreshing start to a much more cheerful document since the state of the economy showed considerable improvement over the previous years. 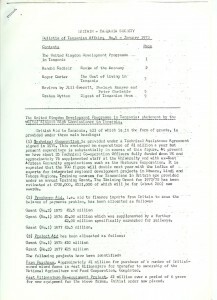 The National Income increased by 5.2% compared with 4.6% in 1975 and only 2.5% in 1974, whilst the food situation eased considerably although it was still necessary to import shs. 177.6 million worth of grain to bridge the gap between production and consumption. The food sector increased by 4.7% and other key sectors such as industry (6.2%), Transport and Communications (6.1%) and Electricity and Water (5%) also increased significantly. Only the wholesale-retail trade showed a decrease, mainly because of greatly reduced orders of overseas goods especially foodstuffs. The balance of payments showed a welcome turn-round, exports increasing from £130 million in 1975 to £205 million in 1976, an increase of 49.6%, while imports declined by 4.8% from £284 million in 1975 to £271 million in 1976. As a result the trade deficit narrowed to £65 million compared to £146 million the previous year. Coffee sales played a big part, accounting for 31% of all exports; cotton, tobacco and tea also fetched good prices. Foreign currency reserves increased accordingly from £55 million to £74 million. Although prices continued to rise in 1976 the inflation rate began to slow down from 15.2% in 1975 to 12.1% in 1976, helped by a considerable fall in the retail price index for lower paid workers in Dar es Salaam from 33.9% to 14% during the same period. The difference between a ‘developed’ and a ‘developing’ country strikes one forcibly when one notices that instead of an endless preoccupation with unemployment this report refers to a 3% reduction in employment from 470,799 paid workers in 1975 to 456,787 in 1976, with a concomitant 2.2% drop in the total wages bill. A very different ‘ball-game’ as the Americans have it! There was a 16% increase in all buildings completed and a 34% increase in buildings other than housing, mainly schools and factories, but also including the beautiful Mount Meru Hotel at Arusha whose foundation stone ceremony I attended in 1973. The completion of the great KIDATU hydro-electric scheme added 100 megawatts to the national grid and also reduced the incidence of power cuts listed by the authors as one of 8 reasons for disappointing industrial output in a number of plants – similar to last year’s frank list of shortcomings. However some comfort can be gleaned from the 104% increase in flour production and the 18% increase in the output of beer and chibuku resulting from the improved wheat crop. On a sadder note a short but poignant paragraph states baldly that ‘in the period 1976/77 the East African Community was in a state of confusion. This period witnessed the break-up of the East African Harbours, Railways and Airways’. It is good to see in a recent news-report that reconciliation is now hoped for early in 1978, since only a truly unified East African Community makes economic sense for young nations struggling for higher living standards in a harshly competitive world. As elsewhere in the world, the cost of living in Tanzania has risen considerably in recent years, though the impact has been unequally divided between town and country. In peasant farming areas the increase has been substantially cushioned by the absence of a wage-cost element in domestic agriculture. The increased burden on peasant families has, therefore, been largely confined to the items bought for money, such as clothing and utensils, but as their money income is small the volume of such purchases is likewise limited. Other increased money costs are fuel and transport. But these increases have been largely offset by the growth in money incomes arising from the sale of crop surpluses. Thus, between 1970-71 and 1976-77 the price paid to the peasant producer of marketed maize rose from 23 cents per kilo to 80 cents per kilo, an increase of 220%. Similar increases in rice and wheat prices are recorded. These rises in price were deliberate acts of government policy to compensate peasant growers for the effects of inflation and to encourage increased food production in the face of the serious food shortages in 1974 and 1975. While the peasant farmer in many areas probably enjoys an improved standard of living as the result of higher market prices for his product, the main brunt of increased prices has fallen on the towns, where normally there is little chance to eke out food requirements by home production. The impact of price rises can be seen from the national consumer price index, which rose by some 132% between 1970 and March 1977. This rise contained an increase in food prices of 169.6%, in fuel, light and water of 207.8%, in transport of 172.6%, in furniture and utensils of 151.3% and in clothing and footwear of 125.4%. Only rents show a fall of 61.7% following the nationalisation of buildings in April 1971. As food occupies 47% of the consumer basket, the price of food exercises a strong influence on the general index. Food prices increased dramatically between December 1973 and December 1974, by no less than 77.5% causing the general index during that period to rise by 40.5%. An important cause of this drastic increase was the serious drought, which severely curtailed home production of food and enforced on the government a large import programme of food grains at high world prices. The subsequent recovery of domestic food production under the stimulus of better weather, higher buying prices for peasant farm surpluses and the national campaign caned Kilimo cha Kufa na Kupona (Cultivation for Life or Death) enabled the government to reduce and ultimately to terminate food grain imports. The ending of food imports and the recovery of home production arrested the growth of food costs and even caused a small diminution of the food index by almost 10 points between December 1974 and December 1975. Food prices then remained stable until the end of 1976, when the upward trend was resumed in the first quarter of 1977 with repercussions on the general index. The food price index rose during this period by 17.9% and the general index by 13.3%. Meanwhile the index for fuel, light and water showed an increase of 69.7%. On the other hand, clothing and footwear prices remained unchanged, while furniture and utensils actually fell by 20 points. The higher cost of food is said to have been due to higher prices for vegetables and fruit, while the rise in fuel costs was laid down to a steep increase in the price of charcoal and firewood. While the national consumer price index gives a picture of the urban areas of Tanzania in general, the Dar es Salaam price indices paint a picture of life In the former capital. There are two such indices, both based on a household budget survey carried out in 1969, one relating to wage earners with an income at that time of shs. 2,OOO to shs. 4,000 per annum, the other to middle grade civil servants earning shs. 3,OOO to shs. 20,OOO per annum. The indices constructed on the basis of this information are published against a base line of 100 in 1969, but in the following paragraphs they have been converted to a base line of 100 for 1970 for comparison with the national index. The fact which springs immediately to mind in comparing the national indices with those for Dar es Salaam is the steeper rise in Dar es Salaam prices, amounting to 248% between 1970 and March 1977 for wage earners. In the same period food prices rose by 274%, a very serious increase for wage earners most of whom depend on the shops for their supplies. During the same seven year period the rise in prices for middle grade civil servants was nothing like as steep, being 141% or only marginally greater than the rise in the national index, while the rise in food prices for this income group was 186%. Still, the rise in consumer prices has undoubtedly reduced the standard of living of the salaried class. With effect from 1st May 1974 civil service salaries were increased by 15% for the first time since 1961, except for a few upward adjustments in starting salaries. No further change has been introduced since that date. However, in view of the exceptional hardships imposed on the urban civil servants in the lowest ranks – messengers and the like – by the prices explosion, the basic starting salary was increased for wage earners from sh. l80 per month (shs.2,160 p.a.) in 1970 to shs. 270 per month (shs. 3,240 p.a.) in 1972 and shs. 340 per month (shs.4,080 p.a) in May 1974. This represents an increase of 88.9%. In the same period the index for wage earners rose by 55% and so also did the group index for food. Thus, in the middle of 1974 wage earners were more than compensated for price rises since 1970. The salaried grades, on the other hand, received an increase of only 15%, while the index for middle grade civil servants rose by 43% and the group index for food by 39%. This adjustment was in line with the general policy of the government to reduce salary differentials; it also had the effect of reducing differentials in real income by making the upper grade civil servants in real terms poorer and the lowest grades richer. Unfortunately this did not last. The subsequent steadily upward trend in prices, especially the sharp upturn in the index in the first three months of 1977, must have caused serious difficulties for families in the middle grades, but its effects on the lowest grades must have been particularly severe. Since 1974 the basic starting rate in the civil service rose to shs. 380 per month (shs 4,560 p.a. ), an increase of ll.8% while the price index for wage earners rose by l24.5%, the food index rising by almost exactly the same amount. It is clear, therefore, that the March 1977 level of food prices, 243% above the 1970 figures, must have produced serious hardship among the lowest paid in Dar es Salaam, whose incomes had risen only 111% in the same period. Food prices in Dar es Salaam may recover from the sharp upturn in the first quarter of 1977 which may have been caused by some temporary problem with supplies. It is likely, however, that any permanent upward shift in price levels will not be continued for long without a corresponding upward adjustment of salaries in the lower ranges. The first national conference of the government party uniting the former TANU and ASP, Chama cha Mapinduzi, opened on 18th October in the Diamond Jubilee Hall in Dar es Salaam. The Conference elected 40 members of the National Executive Committee (NEC) out of 85 candidates, 20 from the mainland and 20 from Zanzibar. 1,480 delegates took part in the conference and the elections. The new NEC met on 22nd. October and elected a new Central Committee. At the beginning of January, the Prime Minister, Edward Sokoine, announced further measures aimed at stopping the drift to the towns. Villagers will in future have to obtain permission before leaving their villages. Each registered village is to be empowered to prevent people leaving without permission. Action has also been taken against ‘vagrants’ in the towns and street traders have been particularly affected in Dar es Salaam. Recent press and radio messages have tried to persuade people that a better life is possible in the villages and efforts continue to be made to use persuasion rather than coercion to encourage people to work on the land. There has been drought in parts of northern Tanzania. There is also a meat shortage and in January the Government announced plans to sell elephant and other game meat from officially culled animals. Tanzania is to receive 7,000 tonnes of maize from the World Food Programme. This will be delivered in three years time and stored with other food grains intended for Tanzania’s emergency grain reserve project. The intention is to reserve 100,000 tonnes in storage. There was an outbreak of cholera in Southern Tanzania in October and November. The Health Minister, Leader Stirling, blamed traditional medicine men for making the situation worse by offering phoney protection. The WHO sent vaccines. Mary Hancock M.P. died in October. Born in England in 1910, she was a volunteer teacher in Tanganyika in 1941. She later became Headmistress of Tabora Girls High School, a Tanzanian citizen and a senior education inspector. In 1970, she was nominated to Parliament by the women’s organisation, Umoja wa Wanawake wa Tanzania (UWT) and elected by the National Assembly (Parliament). Mama Hancock was a much loved and respected figure. A requiem mass was celebrated by the Cardinal Archbishop in Dar es Salaam Cathedral on 28th October. Abdul Karim Karimjee CBE, Speaker of Parliament before and after Independence and Chairman of the Council of the former University College, Dar es Salaam, businessman and prominent leader of the Asian community died in London in September. The October session of Parliament was held in Zanzibar and when Parliament resumes it will sit in Pemba. Members of Parliament debated a number of issues, including an outbreak of tribal rivalry in Singida Region. The Prime Minister, Edward Sokoine, asked members from the Region to stop arguing on tribal lines. He said that nobody had yet come up with ideas on how to stop the bloodshed. The Junior Minister for Home Affairs told the House that 94 people had died in tribal clashes in the Region over the previous eleven years. In November, Kenya stopped all flights between Nairobi and Dar es Salaam and the border remains closed. At the time of closure, imports from Kenya were increasing and constituted nearly 13% of total imports, while exports to Kenya were declining at around 3% of total exports. Since the closure, good progress has been made in attracting tourists and the severe reduction in the number of elephants in Kenya due to poaching appears to have made Tanzania a more attractive proposition for some tour operators. The trade imbalance between the two countries remains one of the difficult problems of relationship to be solved. In November, Vice-President Aboud Jumbe met Kenya Vice-President Arap Moi in Zanzibar and talks were held at official level in Mombasa in December and are to continue. More than 100 Ugandans, formerly employed in the East African Community in Arusha, defied an order from Idi Amin to return home and were granted political asylum in Tanzania. Despite poor relations, however, there were moves in January to reopen trade links in the West Lake Region, which has suffered greatly since the border closure from the disruption of Lake Victoria steamer services. The Minister for Trade, Alphonce Rulegura, called on leaders in the West Lake Region to foster good neighbourliness with Uganda and with Rwanda and Burundi. He said that Tanzania was not opposed to trade links with Uganda. Later, an agreement between the two countries was reached at a meeting at Mutukula between the West Lake Regional Party Secretary (Regional Commissioner) and the Governor of Masaka Region in Uganda. The agreement covered the control of crime, medical services, schools, vermin control, exports and imports and the maintenance of peace. In December, Zanzibaris went to the polls for the first time since before Independence in 1963. This resulted from the introduction of the Constitution of the United Republic, which came into force on 26th. April, 1977, and replaced the previous Interim Constitution. Ten members of parliament were elected and five other elected indirectly. * Together with Zanzibar’s nominated members, they will serve until the next national general elections in 1980. Great interest was shown in the Stone Town result, when Zanzibar’s Chief Justice and presiding judge at the treason trial in 1975, Ali Haji Pandu, was heavily defeated by Jamal Ramadhau Nasibu, a journalist and former detainee. * Zanzibar elects one member for every District in Zanzibar and Pemba. Parliament elects one member from each Region of Zanzibar and Pemba from names put forward by the Regional Development Committee. The Regional Commissioner of each Region is a member ex officio. The Zanzibar Revolutionary Council elects up to 30 from amongst its members and outside. The President appoints up to 20 members from Zanzibar end Pemba. Air Tanzania has started operating services to Burundi, Rwanda and the Seychelles. Other international services operate to Madagascar, Mozambique and Zambia. Following the successful completion of the railway to Zambia, efforts are now being concentrated on improvements to the older railways. Canada is making a grant of shs. 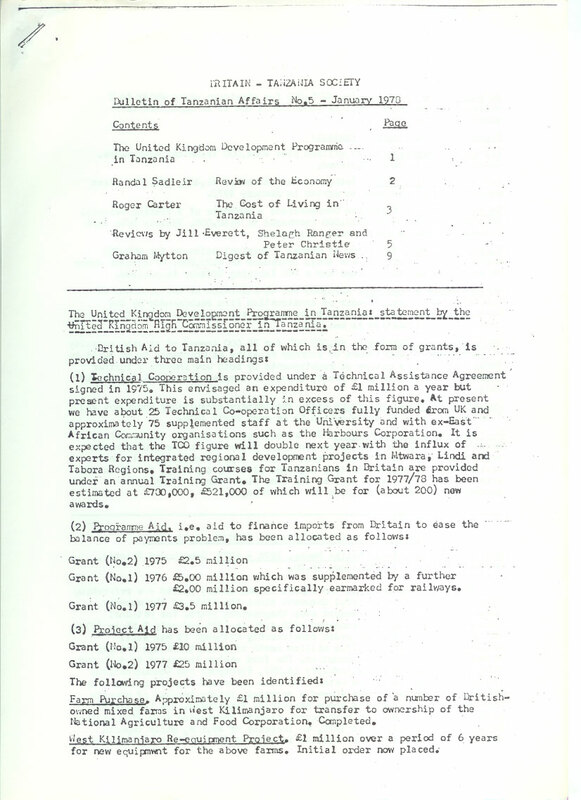 470 million to restore the railway system; the UK contribution is shown under ‘Programme Aid’ in the first section of this issue of the Bulletin. The Canadian contribution is the largest sum ever given by the Canadian International Development Agency (CIDA) to any country and will be used chiefly to rebuild the central line to Kigoma. Following the recurrence of difficulties and delays with Zambia-bound cargo, the Tanzanian and Zambian Governments reached an agreement in December to lift the road weight restriction on the road between Dar es Salaam and Tunduma. It was also announced, following the controversy over the use of Tazara wagons on Zambia railways, that the two railway companies would meet to conclude a wagon-hire agreement. President Nyerere made a State Visit to the United States in August at which, in the words of the Daily Telegraph, he was given ‘red carpet treatment’ by President Carter. It was the President’s first State Visit to America since he was invited by President Kennedy. The President also visited Jamaica and Canada. Dr Leader Stirling, Tanzanian Doctor, with an introduction by President Julius Nyerere, C.Hurst and Co., London, 1977. Leader Stirling’s discursive tale of his forty years in Tanzania is both an important historical document and entertaining reading. In 1935 he went to Tanzania as an expatriate missionary doctor and ended up as a citizen and the Minister of Health. Tanzanian Doctor describes how this metamorphosis took place. The book is full of striking anecdotes about long journeys through tropical forest and scrub land on foot, wild animals, muddy roads, and the characters of his early missionary days, such as Edith Shelley who did so much towards integrating leprosy into other medical work. Inevitably, there is much about medicine and some of the details may be a bit vivid for the squeamish. As Mwalimu Julius Nyerere points out in his Introduction (which is in fact a far better review of the book than I can attempt) Leader Stirling and his fellow missionaries in southern Tanzania worked very hard to provide and improve both preventive and curative medical services in the rural areas – a field in which independent Tanzania – has gained a considerable and well earned reputation. Dr Stirling does not attempt to hide his pleasure in ultimately finding himself holding the reins of this work in the Ministry of Health. I found much of this book compulsive reading and was only sorry to see that it was so expensive – £5.50. Unfortunately, too, the photographs do not come out very well, but perhaps they bear mute witness to the unbelievably simple and primitive conditions in which Leader Stirling and his colleagues laboured for the health of the people in those early days. Vision and Service – Papers in Honour of Barbro Johansson – Editors Bengt Sundkler and Per Ake Wahlstrom, September 1977, Uppsala. The Scandinavian Institute of African Studies and the Swedish Institute of Missionary Research in Uppsala have published this delightfu1 collection of papers to mark the 65th birthday of a very remarkable woman, Swedish by birth, Tanzanian by adoption, who is both a committed Christian and an African Socialist. It contains not only the reminiscences and tributes of old friends and members of the family, some of whom are distinguished scholars and statesmen, but also papers by a wide range of academic writers which together make an original contribution to the recent history of Tanzania and throw a ray of light on the role of the Christian church in a one-party state and in Africa as a whole. We are given glimpses of Barbro Johansson’s warm personality but also of the country and the people she loves so much. Bengt Sundkler in his recollection of ‘First Steps in Bukoba’, where he became the bishop of the Lutheran Church and where she arrived as a missionary teacher in 1946, remarks that she was following in her father’s footsteps. Anders Johansson had been a primary school teacher and headmaster and later became a city councillor of Malmo in Sweden. His daughter, Barbro was in the same way, first a teacher and later a politician. Barbro Johansson began work at the Kigarama Teacher Training College (which was then only for boys) and in 1943 re-opened and rebuilt the Girls School at Kashasha, Bukoba. At this time Tanganyika was still a British Trust Territory. President Julius Nyerere, in his foreword to this little volume, recalls how he first met Barbro when she was a head-mistress. Later the party he led invited her to stand for the Legislative Council when – according to the constitution of the time – it was necessary for TANU to support one African, one Asian and one European candidate in each constituency. She was elected then and re-elected in 1960 to the Parliament which was to take Tanganyika through Responsible Self Government to Independence and to Republic status. In 1962 she became a Tanzanian citizen. Later, on President Nyerere’s request, she became Principal of the Girls Secondary School, Tabora. From 1970 to 1972 she served as a diplomat in the Tanzanian Embassy in Stockholm. The present Ambassador, Mr J.E.F. Mhina, traces the friendly relations between Tanzania and Sweden back to Barbro’s initiative in 1960 when she introduced Julius Nyerere to the political leaders of Sweden at her sister’s house. One of the earliest preventive schemes was soon after 1891, when 5 German military surgeons arrived in the country to establish a medical department. The chief medical officer noted that smallpox lymph vaccine from Germany and South Africa had lost much of its potency by the time it arrived in Tanganyika. He arranged for manufacture of vaccine and made it available to the local African prpulat1on. The vaccine was produced in Dar es Salaam until the British took over the administration in 1916. In 1877 the first hospital and training school for the non-European population was opened in Dar es Salaam. This was through the generous donations of Sewa Haji, a wealthy Indian merchant. The Sewa Haji Hospital continued to function for 67 years and there is now a Sewa Haji Ward Block at Muhimbili Hospital. In the 1920’s hospital and dispensary services and also environmental health services were developed and the beginning of a maternal and child health service was established. The missions were also making a valuable contribution to services. During the thirties with world recession the health services of Tanganyika suffered accordingly, although there were important developments in the training of medical auxiliaries. The authors devote a chapter to the development of university medical education and there is also a summary of the history of Makerere Medical School. The second world war put a strain on an already overburdened service but some light was thrown on the health of the adult male population since about 250,000 African recruits were examined by the medical department during the war years. Out of one batch of 4,000 recruits one third were pronounced unfit and only one third were fit for Active duty. In 1942 the Government appointed a medical officer exclusively for the health of the labour force whose primary duty was to advise employers on promoting the health of their workers and make recommendations to the labour beard. There was steady improvement in the health service after the war with a new medical director and an expanding budget and staff. The new director was the first to prepare an objective long-term plan for the future development of health services. The authors consider in some detail the first and second five-year development plans and consider the 1973 review proposals for health development which deal with decentralisation of the service, organisation and plans for training personnel. This is a fascinating little book on the history and development of Tanzanian health services, full of interest for the lay reader. Health service personnel and in particular those planning and organising services will find this book valuable.